In this post, you’ll learn how to comfortably order low carb at Pizza Hut. You can also get my Pizza Hut low carb menu with basic macros and nutrition stats for all 40 of their low carb options. It’s a great fit for anyone eating keto, low carb, low sugar, or diabetic friendly. My most recent stop was at Pizza Hut which has a location just outside my neighborhood less than a mile away. I admit I’ve been there during some weak moments and certainly never with the intentions of eating low carb. In a hurry? Get my free Pizza Hut Low Carb Menu if you want to see full macros and nutritional stats for every low carb option at Pizza Hut. It lists all 40 low carb friendly items on the Pizza Hut menu (mostly pizza toppings and wing varieties). Now as a low carb eater I’m very uncomfortable ordering there. I want to change that and make Pizza Hut a place where low carb eaters can go with confidence. Onward. I rate Pizza Hut as low carb unfriendly because you must order their baked wings which aren’t that great or get a pizza and eat only the toppings. When will the market learn that there’s a massive opportunity for a crustless pizza restaurant and/or a restaurant that offers cauliflower crust pizzas and is known as the lowest carb pizza chain? It hasn’t happened yet, unfortunately. Low carb entrees on menu – Yes. They have bone-in wings that qualify as low carb. Satiety of low carb entrees – Excellent. I must give Pizza Hut credit here. For my first order, I got 12 Garlic Parmesan Wings and could only finish 10 of them. For my second order, I got a large, five topping pizza and planned toeat all the toppings off the whole pizza as my meal — turns out I only needed to eat half the pizza toppings to get full. Taste of low carb entrees – Mixed Results. My Garlic Parmesan wings started off tasting pretty good, but then I ate a few wings that smelled stale or freezer burned near the bone. It was off putting to the extent that I wouldn’t be very excited about getting them again. Eating the pizza toppings was delicious, but forced me to confront the uncomfortable fact that I’d be “wasting” the crust and I was also mildly tempted to eat the crust which would be disastrous if that happened to me or other low carb eaters. Price / value of low carb entrees – Below Average. I paid $12.75 for 12 wings and then $11 for a 5-topping large pizza. When you tack on taxes and the tips that I added to the tab when picking up the food, it gets kind of pricey. Ordering experience – Below Average. My first order was a call in order where the cashier seemed very impatient with questions about wings, salads, and crusts. My second order was placed directly through the Pizza Hut website and went smoothly. The dilemma with Pizza Hut is should you order the wings and risk dissatisfaction with your food or do you gamble with a tasty pizza and trust that you’ll be able to eat only the toppings? If you do find yourself ordering low carb at Pizza Hut, I have some tips for you below. My first doing a Pizza Hut keto diet order, I went with twelve bone-in Garlic Parmesan Wings and a side of bleu cheese. The bone-in wings from Pizza Hut have about 1 carb per wing, so they’re safe for low carb eating and you could call them Keto Pizza Hut Wings if you wanted. I was kind of flustered when I made the order because the Pizza Hut employee on the phone was being short with me. She seemed to lose her patience with me despite the fact that I was being cordial and inquisitive about the menu. This doesn’t bode well for other low carb eaters who might get dejected or feel uncomfortable when asking menu questions to Pizza Hut employees. When I picked up the order, I was pleased to see that Pizza Hut serves their wings in special, spherically shaped plastic containers which helps the wings retain their heat and crispiness better than the to-go styrofoam containers I’ve gotten from local wing restaurants. My first few wings were delicious and I started to come around to the notion that wings might be a good solution for peeps trying to order low carb at Pizza Hut. Then I ate a few wings that smelled stale or freezer burned near the bone. That ruined the experience for me and made it such that I can’t genuinely recommend them at this point. My second time to Pizza Hut, I wanted to see what it would be like to order a pizza and then eat only the toppings. This is a dangerous game to play, but I wanted to give a complete review. Of note, I first tried to get Pizza Hut to bake me a pizza without the crust but the employee on the phone told me they couldn’t and wouldn’t do it for me. Later, I found a promotion on their website where I could get a large, five topping pizza for $11. Seemed like a good deal for me as I was only interested in the toppings anyway. From reviewing the pictures and text on the their website, it seemed like the hand tossed pizza would get me the most total surface area of toppings, so that’s what I got. I ordered a Large Hand Tossed Pizza with Creamy Garlic Parmesan Sauce, Green Peppers, Ham, Onions, Italian Sausage, and Banana Peppers. I was trying to achieve a mix of high calorie, fatty stuff like sausage and ham as well as some colorful veggies. Once I got the pizza home, I scraped off four slices worth of toppings, plated it and ate it with a fork. The toppings were actually delicious to eat with a fork. And it was surprisingly filling. I expected to need to eat the entire pizza worth of toppings to get full, but I only needed to eat half and saved the rest for later. It was just as good as the Domino’s crustless pizza toppings I ate. I was briefly tempted to eat the crust. This could be disastrous for inexperienced low carb eaters who haven’t developed their grain-resistant force fields yet. Tiny pieces of dough adhered to the toppings as I scraped them off. Not a big deal for low carb purposes, but this could be problematic for celiac sufferers. I had to confront the fact that I was wasting food. Even though grains are fat-inducing toxins, I felt regret throwing the whole crust into the trash. 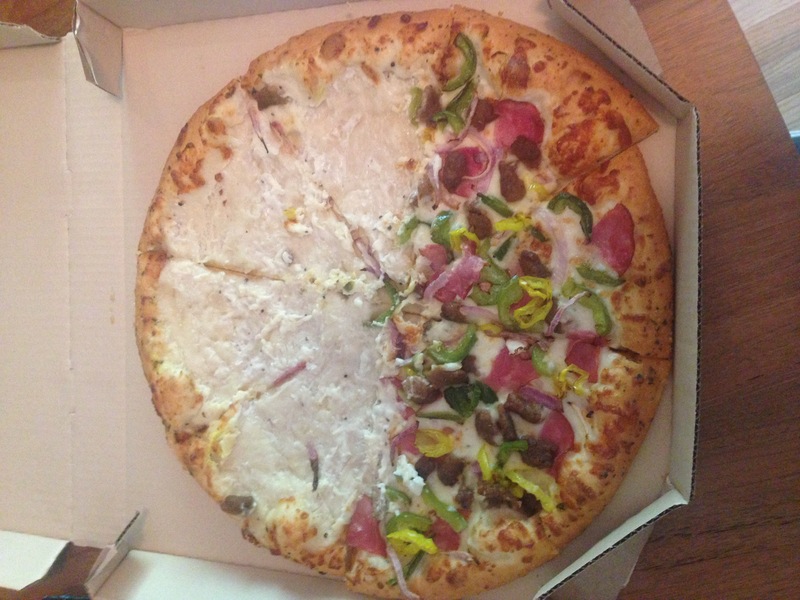 If you’re curious to see what my pizza looked like with the toppings scraped off, you can view that here. I didn’t embed the photo into the post because I don’t like having visual triggers of carb-heavy foods on my blog posts. If your new to low carb eating and stuck ordering from Pizza Hut, get six to twelve Naked Bone-In Wings. They are zero carb, and assuming they give you a fresh batch, will be decent enough to tide you over til your next meal. Each wing is 80 calories so they should be very filling. Importantly, you should specifically request “Bone In” wings because Pizza Hut also has a “bone out” variety which are much higher carb. If you’re an experienced low carb eater and have no problem resisting and throwing away high carb baked goods like warm pizza dough, then get a Medium Pizza with Creamy Garlic Parmesan Sauce, Green Peppers, Ham, Onions, Italian Sausage, and Banana Peppers. Scrape all the toppings onto a plate, toss the crust into the trash, and then eat all toppings. The Cream Garlic Parmesan Sauce is especially great (instead of traditional, tomato-based pizza sauce) because it’s delicious , high calorie, high fat, and low carb. You can also get a pizza and plan to scrape the toppings off yourself. If you’re planning this riskier pizza order, then I’d advise you review my low carb Pizza Hut menu so that you pick toppings with enough calories to satisfy you. Get my Pizza Hut Low Carb Menu if you want to see full macros and nutritional stats for every low carb option. My menu has only the 40 items that are low carb friendly whereas the official Pizza Hut lists 900+ items that you have to sort through. It’s the same, custom low carb menu I used to plan my order before going to Pizza Hut for this fast food challenge. Avoid all of Pizza Huts pizzas, breaded-bone out wings, sandwiches, pastas, breadsticks, pizza rolls, fries, desserts. They’re too high carb. You should also avoid their marinara sauce and honey barbecue sauce. Trust me. I’m as sad as you are that the Buffalo Wing flavors are too high carb :(.